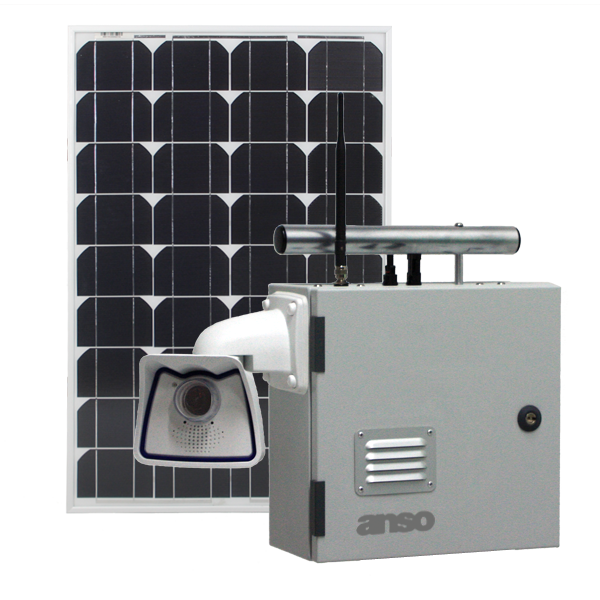 Industrial 6 MegaPixel Ultra HD+ extreme remote web camera system for 12 hour daytime solar applications. The latest in 3G/4G-LTE wireless broadband internet and solar power technology, combined with an industrial quality high definition IP camera. This fully stand alone image recording and live monitoring solution is ideal for Australian regional locations such as farms and reservoirs, mining and construction projects and other applications where camera locations do not have fixed power or internet connections. 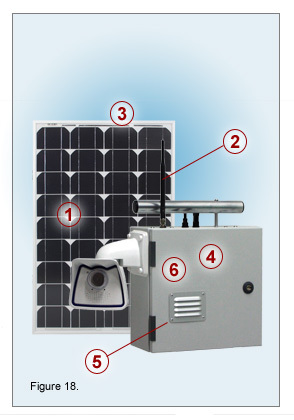 With the rapid development of wireless 3G and 4G broadband internet, supported by today's affordable solar energy solutions, this true stand alone camera recording system is now achievable. To compliment these technologies we utilise a premium ultra high definition web camera with amazing functionality. 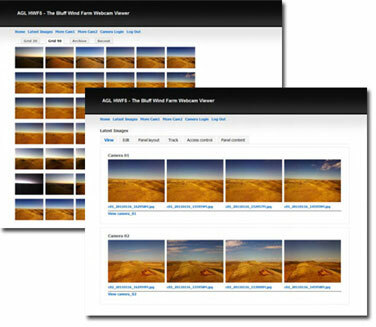 The quality of the camera and the images it produces revolutionises the use of webcam applications. Sentinel system recommended for 12 hour daytime operation only. For 24/7 operation please refer to our Commando range of systems. 1. Ultra high definition 3072x2048px Multi-Stream single interchangeable lens outdoor camera delivering stunning resolution in extreme conditions. 15 frame per second full resolution streaming video (bandwidth and power permitting). The multi stream system will allow multiple simultaneous image/video stream settings for simultaneous applications. 4. High quality mono-crystalline solar panel. High efficiency, long life, heavy duty panel frame for exposed conditions with UV stabilised outdoor rated cables and connectors. 6. Second stage load timer to more efficiently manage internal power usage or limit times for internet connectivity. Industrial power resource reliability for long term timelapse projects and permanent remote monitoring applications. This system allows for the powering up and down of camera and communications within the unit while charging systems continue uninterrupted. 7 day fully programmable digital timer, with up to 8 separate programs per day and separate battery backup for complete program reliability. Highest quality 6 megapixel IP camera designed for use in the most challenging applications and extreme outdoor environments. This camera boasts Ultra High Definition 6 Megapixel (3072 x 2048 px) resolution, allowing for the delivery of extremely detailed images and coverage that is over 20 times larger than a standard VGA CCTV camera. Available with various interchangeable fixed lenses to select the field of view that is suitable for your application. Choose from seven different lenses from a super wide 103 horizontal view down to a telephoto 8 horizontal view for distance applications. There is a lens to suit all applications. With highly advanced configuration options such as custom image profiles, extensive exposure control and complex event capture programs, this camera also includes leading IP camera advancements with the latest in ultra low light moonlight image sensor technology and activity sensor video motion event triggers. Multiple imager/video streams can be delivered simultaneously in different resolutions, frame rates, and image qualities for viewing on different platforms so as to meet different needs or bandwidth constraints. This enables digital manipulation of the live viewing window while keeping the other image profiles set for active event capture. The IP camera of choice for the most extreme locations around the world from mountain tops, to tropical rainforests or arid desert conditions, this camera can do it all. Thermographic lens for 24/7 detection with a 6MP colour lens for identification. Sealed, non spillable 20 Amp/Hour Lead Acid Battery. It is highly recommended that the Sentinel range of systems are used only for 12 hour daytime applications. Although the 20A/H battery in the system will generally keep a system running throughout a full night when fully charged, these systems will not sustain permanent 24 hour usage throughout all weather conditions.